Long hours of practice can leave a “dent” on the underside of the forearm of your picking hand where it meets the edge of the guitar. Ouch! The Oasis® OH-9 Padded Guitar sleeve cushions your arm and distributes pressure that can lead to compression of nerves and structures. This sleek black sleeve looks a whole lot better than an old sock and it feels better too! Measure the circumference (the distance around) of the widest part of your forearm. I met Chaconne Klaverenga (above) at the 2006 GFA (Guitar Foundation of America) competition. She was wandering around the vendor area with her parents playing classical guitars being offered for sale by the various luthiers attending the event. At the time, she was 13 years old and competing in the junior competition. There were lots of young competitors playing guitars. Far and away, Chaconne rose above the rest of the players. She continues to improve her skills and has won many competitions. 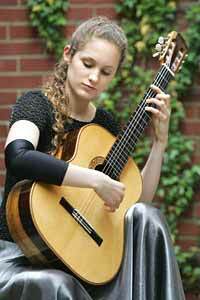 Her parents are accomplished musicians and own a music store in Lafayette, Indiana (Oasis dealer). 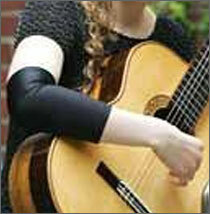 Chaconne uses an Oasis Guitar Sleeve to protect her guitar and improve comfort. MP3 file (Allegro from BWV998; J.S. Bach).